As the World Purrs: We're Back! Gus: With the Mama's job responsibilities, we weren't able to blog in the last few months but hopefully things have calmed down a bit so that we can bring you all the antics of our students. With that, I would like to introduce you to our current class. The Coffee & Cookie Kits! Parisi, Oreo, and Cookie! For those of you who don't know, Parisi is a coffee company here in Kansas City. These kittens will be graduating soon. They were surrendered by a family that had too many cats. They are already 8 weeks old. They need to gain a few more ounces to reach 2 pounds and be big enough for their spay and neuter surgeries. We haven't taught the minions students how to take selfies yet but I'm hoping our friends at The Cat On My Head won't mind. 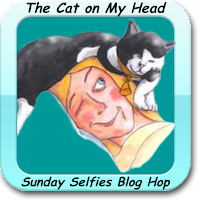 We've missed participating in their Sunday Selfie Blog Hop. Please join us in visiting the other blog hop entries. Welcome back! They are all cuties. Welcome back! Your new class is purr-ecious!!! Welcome back! Your students are gorgeous!! If you are really back, would you like to do an interview with us felines for Mousebreath.com? We would love to get to know you better and so would others. Please let us know. We'd love to be interviewed!